This post brought to you by Campbell’s Slow Cooker Sauces. The content and opinions expressed below are that of One Sweet Appetite. 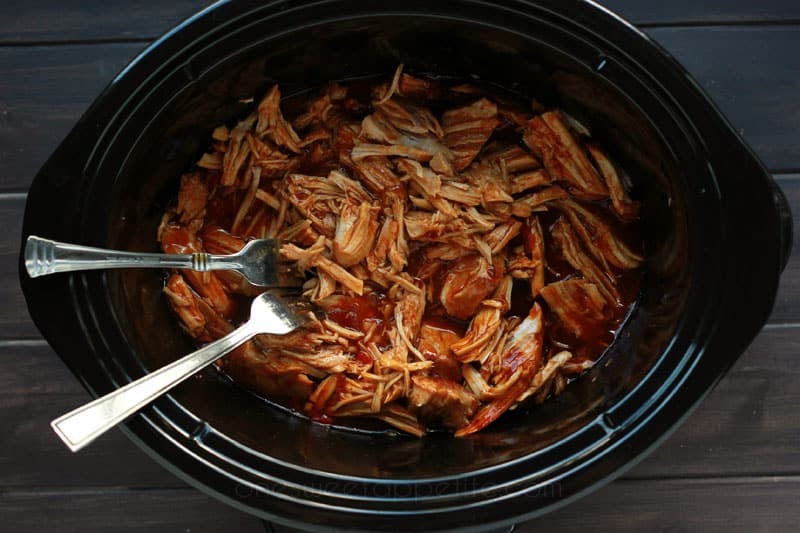 As a working mom I am always on the hunt for super simple family meals and one thing that seems to get overlooked is my slow cooker. Why, oh why, do I not use this thing more often? 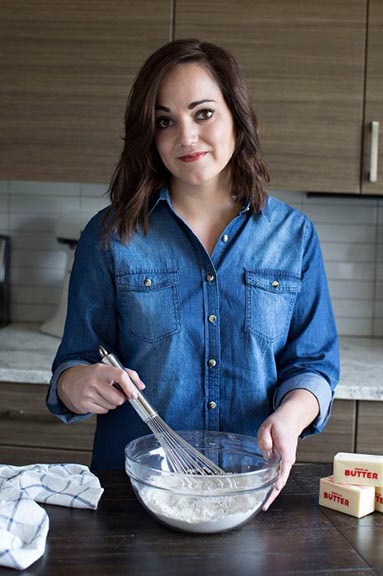 Seriously… the thought that I can just toss ingredients into one bowl and walk away is as easy as it gets. 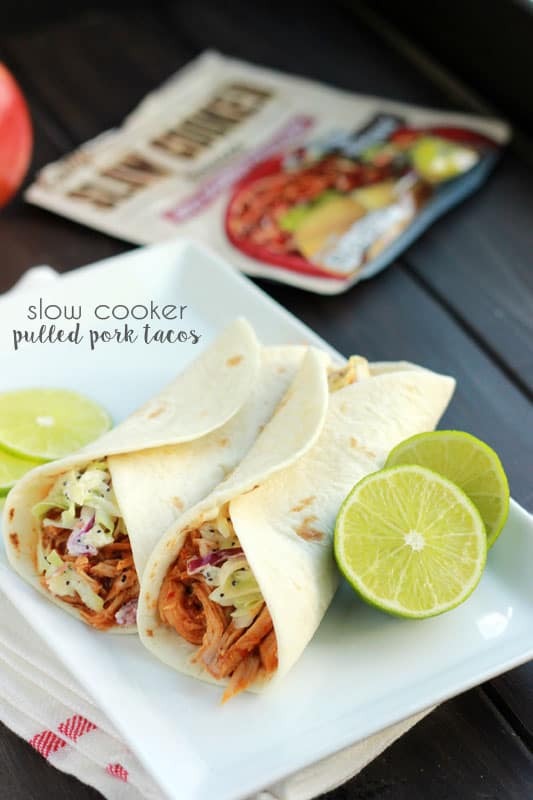 What makes these easy pork tacos even better is that they only require a few ingredients! 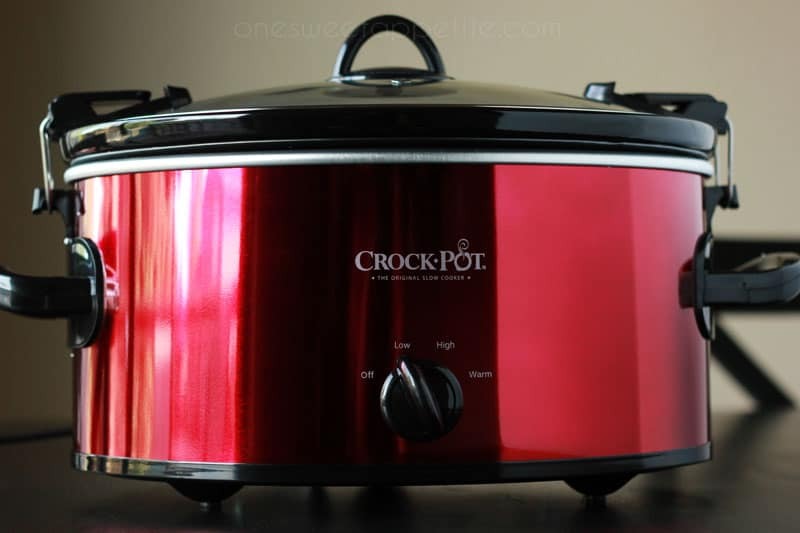 But FIRST, you need a Slow Cooker! I love this one for the locking lid. That feature is a MUST if you plan to take your meal to a pot luck or gathering. I started with a pork roast. This one was 3lbs which is a good size if you are feeding a hungry crowd (think game day) or a large family. It also made it so that my family of 3 could save some for leftover meals. Next I added my secret ingredient! 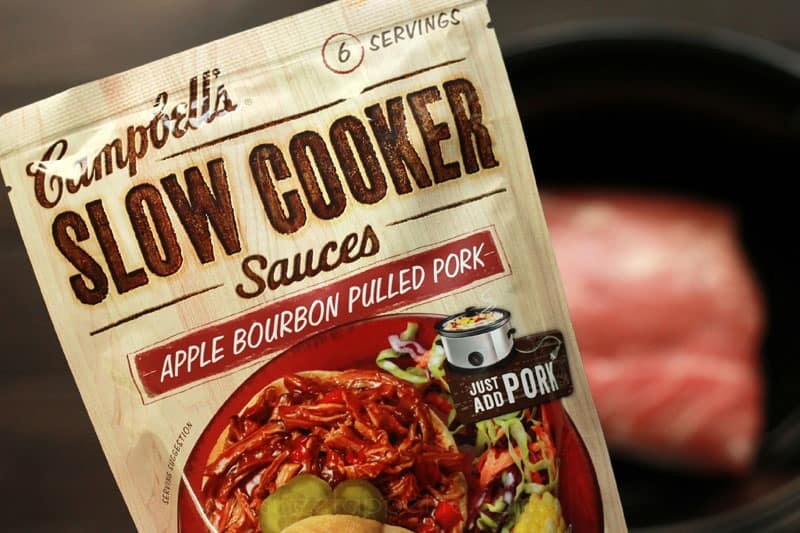 The line of Campbell’s Sauces come in a variety of flavors and I decided to try the Apple Bourbon Pulled Pork and it was phenomenal. These packets are “Easy to Use”, whether for an Every Day meal or Game Day get-together and keeps your ingredient list to a minimum. I just poured it directly over my meat, placed the lid on the cooker, and let things cook for about 8 hours. That means my total prep time was UNDER 5 minutes which frees up the rest of the day for more fun things! When it came time to shred the meat it was so tender. I just used to forks to pull it apart and tossed it in the surrounding meat. Easy peasy. Toss your meat and some of my apple slaw onto a tortilla and you’ve got the perfect meal. We used these as a pot luck take along and everyone begged for the recipe. I’m pretty sure you could make this with any of the six flavor choices;Tavern Style Pot Roast, Apple Bourbon Pulled Pork, Beef Stew, Southern BBQ, Sweet Korean BBQ,or Hawaiian Pork. 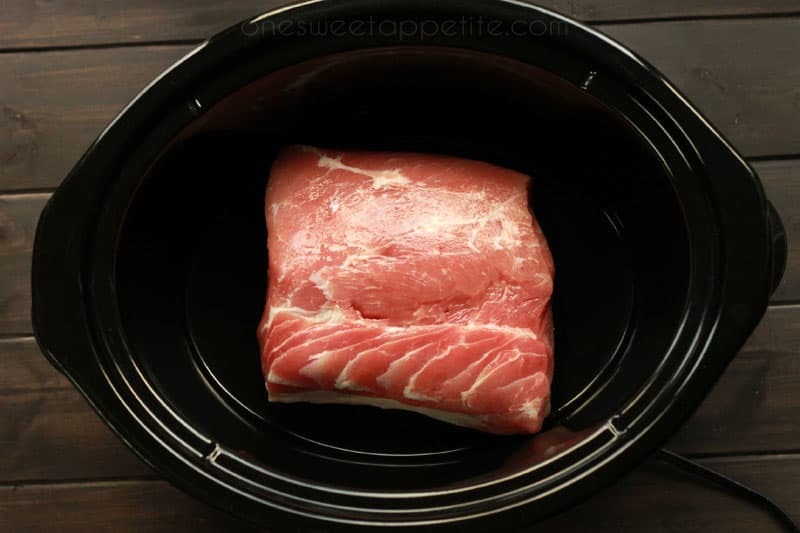 Place your pork roast in the bottom of your slow cooker. Pour the Campbell's Sauce over your roast. Cook on low for 6 to 8 hours. Shred the meat using two forks. Toss in the sauce to coat. 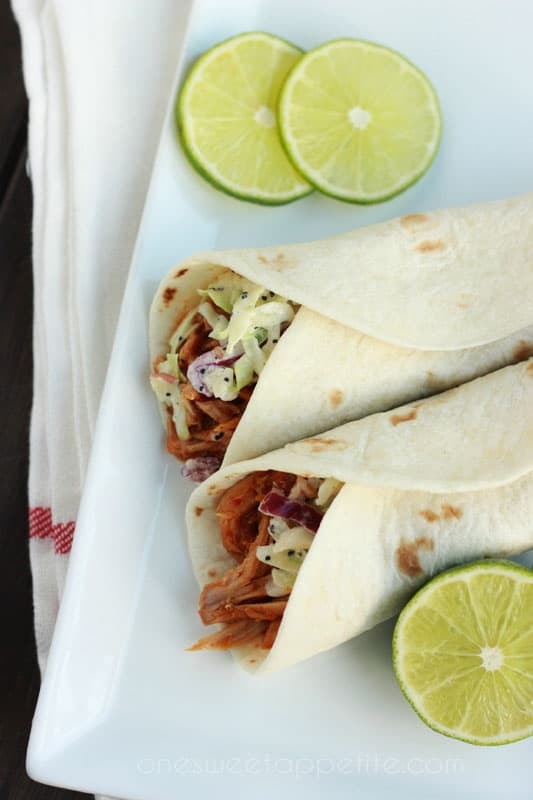 Fill tortillas with pulled pork and top with slaw. Enjoy!